Toddler Approved! 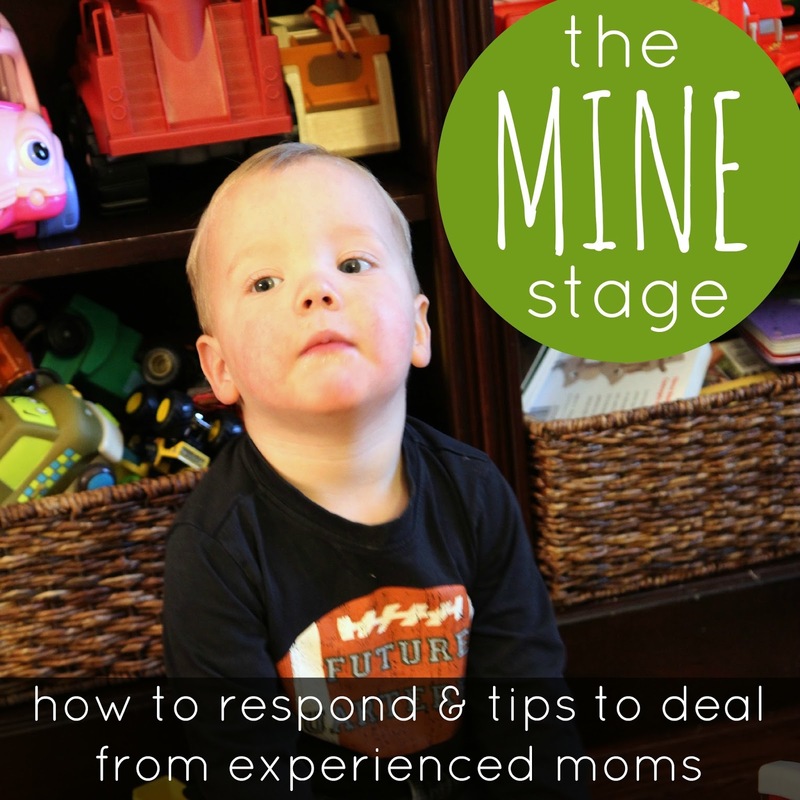 : Tips for the Toddler "MINE" stage. Tips for the Toddler "MINE" stage. 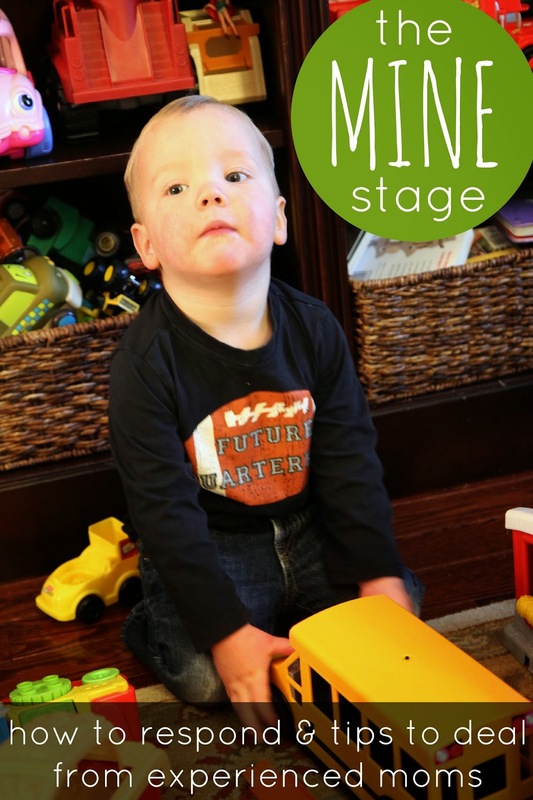 The toddler "MINE" stage can be frustrating! Although it is just a stage it can still be a really hard time period as a parent. Today I want to share a few ideas with you from experienced moms regarding how to respond when your child is yelling "MINE" and getting overly upset about toys and other objects... and a few tips regarding how to deal with this stage as a parent. We chatted about this topic recently in our Toddler Approved Positive Parenting Facebook Group and several moms had some great suggestions. Before we talk about how to respond to kids who are yelling "mine" and grabbing or possibly getting aggressive or emotional over objects, let's step back and talk about toddler development a bit. Alice Sterling Honig professor emerita of child development at Syracuse University said "Mine is often one of the first words toddlers learn and an intellectual milestone; once a child understands the feeling of ownership, he is on his way to learning to share... Identifying ownership isn't a sign of selfishness -- it's a sign of knowledge. It demonstrates a desire to understand the world." I think understanding that the "mine" stage is important in toddler development makes it a little bit less frustrating. Sometimes I have to repeat over and over again, "this is just a stage." That being said, the way that we react to a toddler yelling "MINE" can either help decrease the explosions or increase them. Prep them ahead of time regarding the expectation with toys when they go somewhere. Practice at home asking for toys and waiting for turns. If your child has an especially hard time and yells MINE a lot when having friends over maybe structure playdates or get together with friends at the park or somewhere with communal toys. Although you want to put kids in situations where they need to practice taking turns, sometimes as a parent you just want your child to go and play and not have to mediate. This is pretty simple to do and kids "get it" as they have more social experiences. If your child is sad that a friend is using their toy just reassure your child and acknowledge his feelings. "It is hard to take turns with your toys. Tommy is using your car right now. You can have a turn when he is done. Do you want to play trucks while we wait?" There is no need to arge with your toddler. If your toddler feels the need to walk around the house and point at every toy and say, "mine," "that's mine," etc. ignore her. There is no need to respond every time and say, "Actually no, that's your brother's toy and he is being nice to let you borrow it..." or "No that's my cup," or whatever. Toddlers latch on to words and are exploring ownership. You will drive yourself insane if you constantly try and correct them. Model the language you want them to use as you interact together and praise them when they aren't constantly saying mine. If you give kids ownership and power over their special toys, they will feel a little less stressed when friends come over. I let my kids hide any special toys that they don't want friends playing with during playdates. They obviously can't hide the entire house, but giving kids control over a few belongings helps them feel less anxious when friends come over. 5. 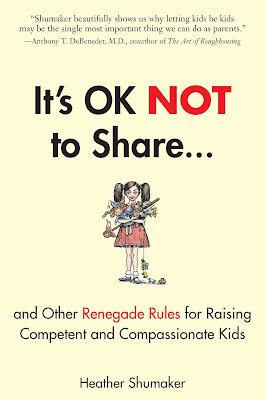 Give ample opportunities to practice sharing with you, "Yes that block is yours. Would you like to share it with me?" One of our Toddler Approved community members mentioned that she uses this language with her child. Practicing being generous and using kind and polite language with your child is a great way to model appropriate turn taking. Over time you will find your child will begin copying you! Turn taking is especially hard in new environments and when you are hosting new friends at your house. Practice turn taking skills when you are at home in a safe environment with family or close friends to help your child feel confident using their words, asking for turns, or telling kids that they are using a toy and the other child needs to wait. We have a rule at our house that kids can have long turns when we are home. That means that they get a toy and get to decide how long they want to keep it. We don't use long turns when we are outside of our house. My kids might have a long turn that lasts all day and that is ok when we are at home. You can read more about long turns and some of my favorite sharing strategies in Heather Shumaker's book (affiliate link) It's Ok Not to Share. 7. Encourage kids to say, "Can I have a turn when you are done?" or "I am using _____ right now, would you like a turn when I am done?" These statements are probably the most important phrases we use in our house. My toddler has learned to say, "Can I have a turn when you are done?" and with experience has realized that (most) kids will actually give him a turn if he asks nicely and waits. Not Just Cute talks more about this phrase and how it is such a helpful question for ending fights over toys HERE. 8. Set a good example. Avoid grabbing from kids. This tip is pretty obvious, but sometimes we don't realize that we are actually modeling inappropriate behavior. Make sure you use your words just like you encourage your kids to use their words. 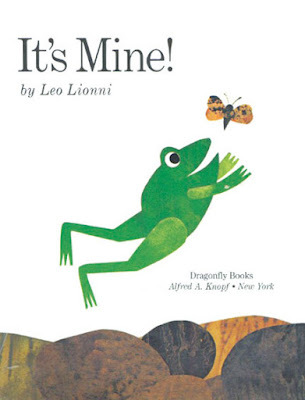 It's Mine by Leo Lionni is a great book to read with kids when you are dealing with the mine stage. 9. Find supportive and non-judgemental friends to hang out with! Some parents will say that their child never used "that word" and some kids are just really easy going and never get into this stage. This stage can be exhausting... especially with toddlers who have extra determined personalities. Spending time with parents who don't judge your parenting and remind you that it is a stage and to "hang in there" are who you want to hang out with as your toddler moves through this stage. Hopefully it will go quickly!! Do you have any tips for how to deal with the "mine" stage and help your toddler move through it? This post only feature nine and I'm sure there are many more! !